#3. Tell her you’d write children’s books too – if you had time. Lee Wardlaw makes time: She’s the award-winning author of close to 30 books for young readers. Where does Lee get the ideas for so many books? 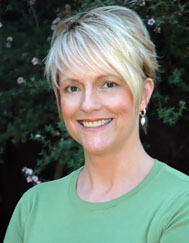 Lee grew up in Santa Barbara, CA, and wrote her first book in second grade. She continued to write poems, stories and plays all through elementary school. At age eleven, Lee and three of her friends formed a rock ‘n’ roll band called The Shooting Stars, with Lee playing guitar and writing many of the songs the girls performed. Lee graduated with honors from Cal Poly State University, San Luis Obispo, with a B.A. in education, and was a teacher for five years before deciding to write full-time. She received her AMI Primary Diploma from the Montessori Institute of San Diego, and studied for her M.Ed. at Loyola University, Maryland. Lee has 30+ years experience presenting lively and interactive programs in grades K-8th. She has also taught a variety of classes and workshops for teachers, librarians, parents and aspiring writers. Lee has won numerous prestigious awards, including the Lee Bennett Hopkins Children's Poetry Award and the Myra Cohn Livingston Poetry Award (both for Won Ton - A Cat Tale Told in Haiku). Her books have also been honored by the American Library Association, the International Reading Association, the Children’s Book Council, the National Council of the Social Studies, the National Council of Teachers of English, Bank Street College of Education, the International School Librarians Association, and more. She is an active member of the Society of Children’s Book Writers & Illustrators, and belongs to the North American Montessori Teachers Association, Association Montessori Internationale, the Author’s Guild, the California Reading Association, Children’s Literature Council of Southern California and, yes, even the Cat Writers’ Association! Lee lives in Santa Barbara, CA, with her family. Check out her newest books: 101 Ways to Bug Your Friends and Enemies(fiction, ages 10-14); Red, White and Boom! (picture book for preschoolers); and Won Ton and Chopstick - A Cat and Dog Tale Told in Haiku (picture book, all ages).